With the summer season here, it’s time for weekend cookouts and BBQs. A good dessert to finish off the meal is a must and one of my favorites to make is homemade strawberry shortcake. I see a lot of people buying those store bought, spongy cake cups that you find placed next to the strawberries at the grocery store. I’ve bought a pack before as well. But I’ve found if you put in a little extra effort by making your own, the dessert tastes even better. 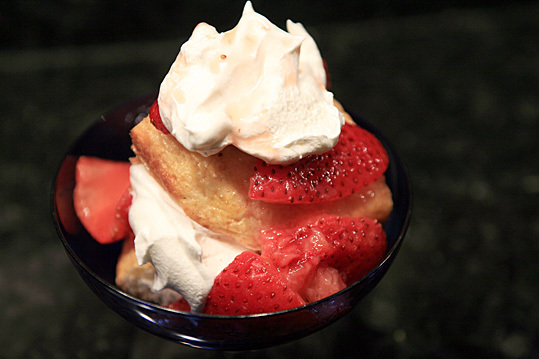 Fresh strawberry shortcake isn’t difficult to make, so I encourage you all to make this for your next Saturday cookout. Preheat the oven to 375. In the bowl of a food processor, pulse together the flour, 1 cup of sugar, zest and butter until the mixture resembles a coarse meal. Transfer the mixture to a medium bowl. In a small bowl, mix together with cream. Slowly stir in the liquid into the flour until the mixture forms loose dough. You want to be careful not to over mix the dough. The mixture will on the sticky side. Dust your hands and tools with flour to prevent everything from going gummy on you. Sprinkle the dough with a good dust as well before moving it from the bowl. On your floured work surface roll out the dough to be about ½ inch thick. Using a 4-inch biscuit cutter, cut out pieces of dough and put on a greased baking sheet. Gently knead together any leftover pieces of dough and roll out to 1/2-inch thick. Cut the dough as before and add to the baking sheet. Bake cookies for 18 – 20 minutes or until the edges are golden brown. Transfer the cooked cookies onto a cooling rack and cool for 30 minutes. **Note** the cookies will expand and may form one large ok. This is ok - just use a paring knife to create individual cookies. While the cookies are cooling, places your halved strawberries in a bowl with ½ cup of sugar and the juice of the lemon. Allow the strawberries to slightly breakdown with the sugar. To serve: In each serving dish, start with a layer of cookie. Break your cookie in half and places in the bottom on your serving dish. Spoon a TBSP on strawberries and the liquid on to the cookies. Top with a layer of whip cream. Continue by following the above steps to make an additional layer. Finish by topping the last layer of whip cream with a drizzle of strawberry liquid.